Resilience is one of the current magic words in psychology, but also far beyond this discipline (vom Orde). Resilience denotes the ability to deal with difficult situations and to emerge from crises stronger than before. The power of resilience is mainly fostered by benevolent and emotionally warm relationships in one’s social environment, but it can also be fostered with specific educational support. If children are encouraged to develop self-awareness and self-regulation, if they experience their own self-efficacy, and acquire social and active coping competencies, they are far better equipped for stress and crises (Fröhlich-Gildhoff & Rönnau-Böse). One method that has been used successfully, especially in therapeutic and educational contexts, is storytelling. Through authentic, strong stories, told in an emotionally involving way, we pass on experiences and can benefit from the experiences of others (Kottler). An example of the successful implementation of this method in an educational context is Storytelling Clubs (Taher et al.). If young people can use media to tell their own story, this fosters their resilience (Mendel & Dillmann). When adults recount their experiences of strength retrospectively, these show – according to the results of a global study – extraordinary similarities. If these stories of experienced self-efficacy are recounted for purposes of resilience-building, and presented in media form in a way that is engaging for children (Götz), then this can strengthen children’s selfawareness and help them deal with their own feelings (Holler). This power of stories is certainly not a new phenomenon. Fairy tales such as those told by the Brothers Grimm are said to be beneficial for children’s mental health, since they present typical worlds of experience in metaphors, and allow children to project their own experiences and aspects of their personalities onto various characters, situations etc. (Wilkes, Barthelmes). At the same time, stories are always told from a specific perspective, around specific heroes and heroines. A recent analysis in 8 countries shows that stories in children’s television centre on male characters twice as often as female characters, and that it is mainly men who write, produce and direct stories for children’s television (Götz et al.). This makes it all the more important to implement innovative approaches, telling stories of diversity, and featuring unusual heroines (Kennett), stories of transgender children (Kalceff), or deliberately different images of boys (Næsheim). 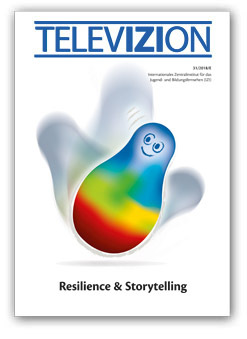 This issue of TelevIZIon gives an overview of how creative formats are equipping children and young people with the skills to deal with crises (Lafleur) and emotionally difficult situations (Stokke), casting them as experts at self-regulation, and thus offering peer education (Hansen). The author describes how storytelling can help to find meaning in suffering, misery and traumatic experiences and promote self-healing and resilience. What is resilience and how can it be promoted? The article describes the concept of resilience, explains the resilience factors, and presents ways in which resilience can be promoted. The article summarises the results of a project for which over 700 biographical stories from 48 countries were analysed, rewritten and produced so that they have the potential to foster resilience in children. The article demonstrates what opportunities fairy tales offer and what role these play in the development of children’s socio-cognitive abilities. Cinderella – What are the potential advantages of fairy tales for children? Who produces, writes and directs? A conversation with Knut Næsheim on My best friend Marlon. You can order a paperback version of this special issue of TELEVIZION by sending an e-Mail.